Microsoft wants you to be extra secure so it plans to lock your PC anytime you walk away from it. Windows Central reports the company is building a new feature for Windows 10 that will automatically lock your screen whenever you step away from your device. While Microsoft refers to the new functionality as ‘Windows Goodbye,’ the feature will be dubbed Dynamic Lock once it makes its way to the official build. The technology essentially compliments the Windows Hello solution the software-maker introduced a few years back. Replacing the standard password and PIN method, Hello uses special cameras to enable users to log in to their machines by simply scanning their face. In a nutshell, Dynamic Lock merely reverses that process for further protection. While little details are available as to how Microsoft plans to accomplish this result, chances are the technology will leverage Hello-enabled cameras and sensors to detect whether a user is present or not. Reports suggest that the feature will leave the screen active for a brief window of time before eventually locking it in order to avoid turning a healthy functionality into a blighting annoyance. While Dynamic Lock certainly appeals to my sense of security, it somehow still unnerves me. The idea that my laptop is constantly seeking to detect my activity inevitably makes me worried about the safety of my privacy – and this is certainly something I value a lot. I guess it’s a good thing Microsoft will give users the option to choose whether or not they want to take advantage of this feature. 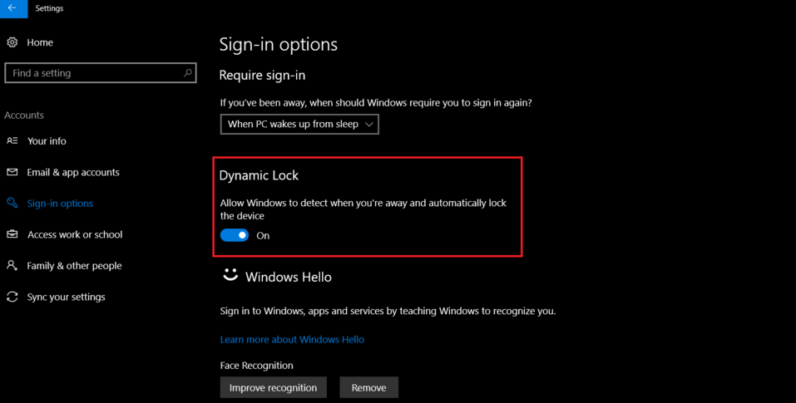 Dynamic Lock is slated to roll out as part of the upcoming Windows 10 Creators Update which will arrive later in April.